If you love neon and are working to a tight budget then this is a great option as the LED neon is lower cost compared to hand-blown glass neon. Also if you have kids or pets the LED neon tube is almost indestructible making it a great solution for kids bedrooms, busy hallways or other vulnerable location, for example in a packed bar. The LED composite tube can be fully exposed with little risk of breaking. 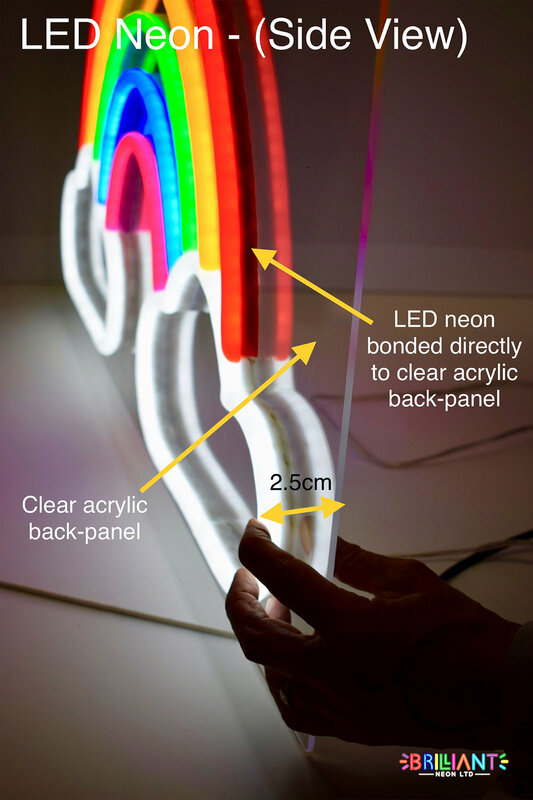 We bond the LED neon tube directly to a clear acrylic back panel which can then be cut around the shape of the LED neon or left as a rectangle. The sections of LED neon are wired together to a electrical supply lead which then runs to an in line transformer (similar to a laptop) and then to a standard UK plug. The LED neon runs on a low voltage 12 volt supply. We are able to offer a dimmer unit which simply plugs into the lead and allows the LED neon to be dimmed down to 20% of it full power...making them an ideal night light for the kids bedroom!